India’s no.1 singing talent hunt reality TV show Indian Idol of Sony Television channel 2015 auditions has been started at various cities in India. The 2015 Kolkata Audition of Indian Idol Junior Singing talent hunt is on 4th & 5th April 2015 at Swabhumi. 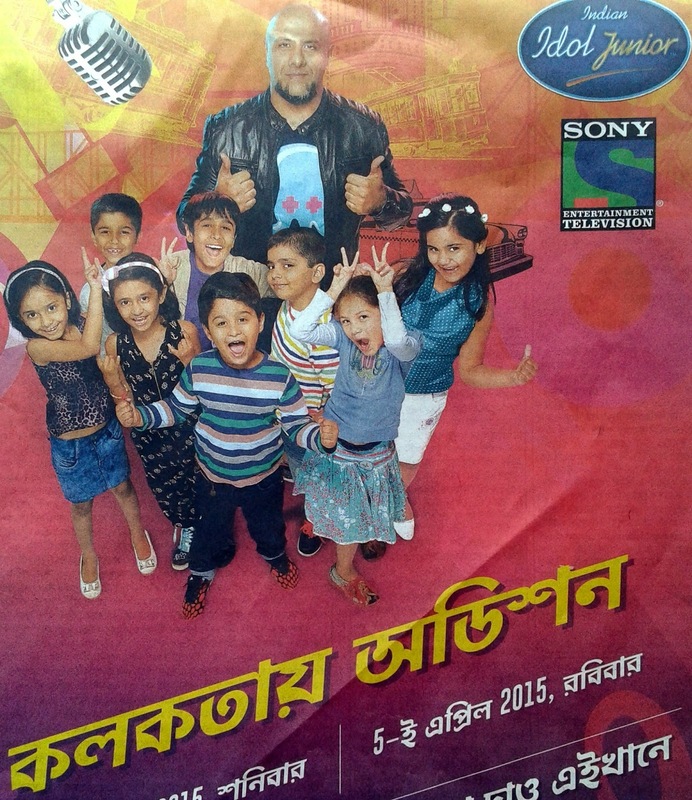 Let’s check out few details of Indian Idol Junior Kolkata Audition 2015 now. • 2015 Indian Idol Junior Audition, Kolkata Date Schedule: - Indian Idol Junior Kolkata Audition is going to happen on 4th April (Saturday) and 5th April (Sunday) 2015. • 2015 Indian Idol Junior Kolkata Audition Location / Address: - The Kolkata Audition of Indian Idol Junior is going to happen at Swabhumi – The Heritage Plaza, 89C, Moulana Abdul Kalam Azad Sarani, Opposite of Subhas Sarobar, Kolkata-54. India’s No.1 Singing talent hunt i.e., Indian Idol Junior, which is dedicated to children, 2015-2016 season audition is going to happen in Kolkata. Thus, all aspiring child singers are requested to come with all necessary documents at Audition place. Please visit www.sonyliv.com to know what documents to carry, what documents required for Indian Idol Junior application process, what’s the age limitation for Indian Idol Junior participation and other queries. Don’t miss the chance of establishing yourself by participating in Sony TV Indian Idol Junior Singing reality show. The biggest Singing Talent Hunt Reality Show is back with it’s sixth season and the registration process for the participation to Sony TV Indian Idol Season-6 has been started. Kolkata has produced so many singers over the years and now it’s your chance to make your career and stamped your authority in the music industry. Sony Television channel & Indian Idol Reality Show provides the platform to the singing talents to show their skills to the world and to become Singing megastar. The Kolkata Audition of Indian Idol Season-6 2012 process has been started online. Indian Citizens both (male & female) can register themselves Online at www.myindianidol.com website and should upload their Singing Video to complete Online Registration Process to Indian Idol Season-6 2012 audition. The Online Registration Process of Indian Idol 2012 has been started from 16th February 2012 and will close on 19th March 2012 for the Kolkata Audition of Indian Idol 6. Those who want to register; are requested to upload their singing videos to www.MyIndianIdol.com within 19th March 2012 for the Sony Indian Idol 6 Kolkata Audition which will be done on 23rd March 2012 and 24th March 2012. The Indian Idol 6 Kolkata Audition face-to-face interview (audition) is on 23rd & 24th March 2012. Please check all other venues & dates of Indian Idol 6 Auditions in India. Get ready & achieve your destiny through Indian Idol 6.